One and a half hour (1.5) workshops are held twice a day every Wednesday. Develop an understanding of all of the steps involved in purchasing a home and prepare yourself financially. Then work your plan so that you can take the next big step of enrolling in Homeport’s 8-hour home buyer education workshop. You will hear what lenders look for in an application for a mortgage. Plus, review frequently asked questions with our Housing Advisors and get a chance to ask your questions. We are offering a special discount for our Tuesday workshop courtesy of our partners. Please check the Eventbrite registration page for the discount code! What you will learn: Learn each step of the home buying process. As a couple in their mid 30s with three young boys, Delmecia and Dwight Wilkins are living the dream, enjoying a beautiful two-story single family home with fenced back yard and trampoline. Their residence in Obetz since 2015 is constructed on a series of financial and home buying education courses from Homeport they took after experiencing foreclosure and an embarrassingly low credit score. In 2006 the Wilkins qualified for a $115,000 three-bedroom, 2 ½ bath, 1,500 square foot home in Canal Winchester to raise their then two small boys. They were approved for a mortgage on her $10 an hour job and Dwight’s part-time job at $11 an hour. Then rough times struck. A few weeks before closing, they both lost their jobs after missing work to attend the funeral of Dwight’s grandmother in Maryland. The deal closed. And though the Wilkins eventually found work, jobs that paid more than what they had previously earned, they never seemed to catch their financial breath, a problem exacerbated by an increase in their mortgage payment. The Wilkins, the older boys and now an infant son, moved in with Delmecia’s sister and eventually on to apartments. By 2013, the Wilkins, on the advice of a co-worker, decided to take some personal finance and home buyer courses offered by Homeport. 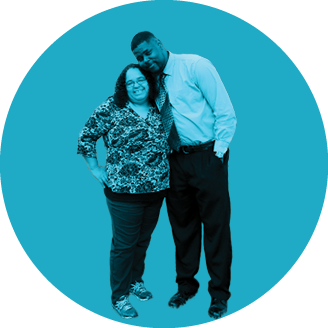 The rebound began in 2013 when Delmecia and Dwight took a Credit Counseling course from Homeport’s Housing Advisory Center. They followed it in 2013 with Homeport’s Financial Fitness course. Finally, in 2014, they took the Homebuyer Education course offered by Homeport. By 2015, the long road back to homeownership was over. They and their boys were living in a new 2,400 square foot home with four bedrooms and 3 ½ half baths. It all worked out, said Delmecia, an office manager for Franklin County.